It is amazing to see that we have new games for Amiga CD32 in 2016! Today I want to take a look at a new CD32 game called Catacomb 3D, which is a sneak preview of the game provided to me by Pascal Papara ahead of it's release. Thanks mate! For those who know their game history, they will know that Catacomb 3D was originally written on the IBM PC in 1991 by ID Software, and was the prequel to the classic game Wolfenstein 3D. Catacomb 3D was a landmark 3D game that lead to ID Software classics like Wolfenstein 3D, Spear of Destiny, Doom, Quake and the whole first person shoot em up game genre which is still very popular today. I am embarrassed to say I have never played Catacomb 3D before, and so the first time I have ever played it is as a port to the Amiga CD32 in 2016! The funny part was I remember back when these 3D PC games in the 1990's were being touted as not being able to be run on an Amiga and was a strong reason why many people went PC to play these games. How wrong was that decision - we have Doom, Quake, Heretic, Hexen, Wolfenstein 3D, Descent, Rise of the Triad and many other PC games from that era that run fine on Amiga! And now, in 2016 we have the game that started it all, Catacomb 3D on Amiga CD32! 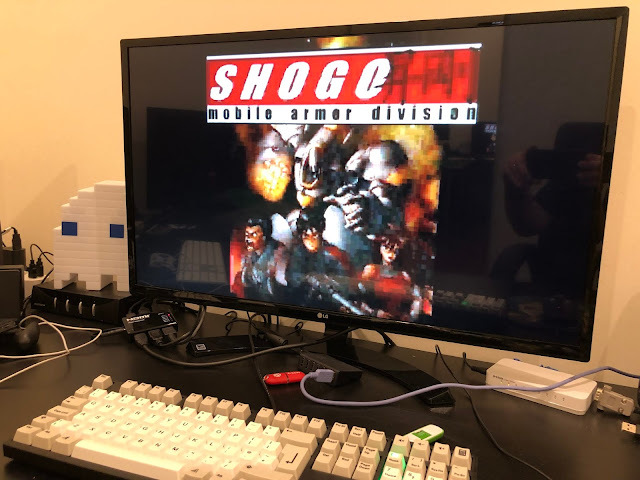 It was ported by Bzili, and will be released soon as commercial game to purchase as a CD32 title from Ares Shop, Ebay and potentially other vendors that are interested in distributing it! You can even play a simple pong game from this menu called Skull N Bones! Still makes me smile seeing this running on a CD32! The longer you hold done the fire button, the more powerful the shot you fire. The level is indicated by the level of the nuclear explosion graphic on the right side of the display. The Health boosters (called Heals) are essential to get anywhere in this game as you need to keep healing yourself as you go along. 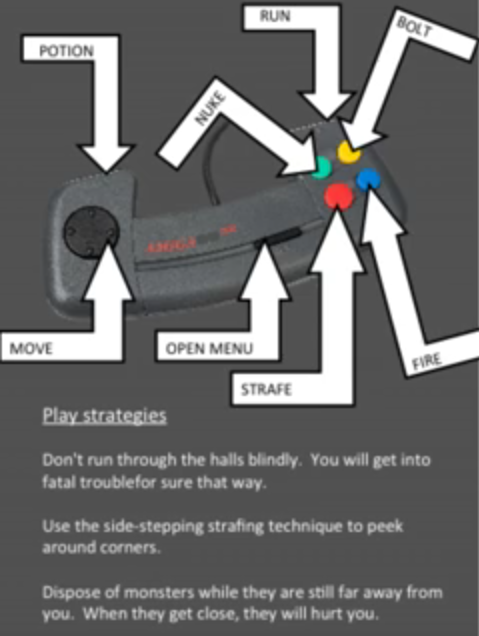 These functions are mapped to various buttons on the CD32 joypad as shown earlier. Health is shown graphically with your head on the top right, which turns into a skull the more times you are damaged. You die if it changes to a full skull! Making things even more interesting is that you can shoot the walls, some of which reveal secret tunnels and passages - some even lead to whole secret levels! This game will also run on Amiga 020 systems like Amiga 1200 and 4000, and ideally runs best with 4MB Fast memory. It does run ok on 2MB memory though, like on my Amiga CD32 I tested here. Catacomb 3D is a very fun and challenging game. I am grateful for the sneak preview of the game on CD32 and it is expected to be released very soon to purchase, so keep an eye out for it! Thank you for the nice review. I'm still working hard to make sure players get the best possible experience even on unexpanded systems. Saving is definitely possible on the CD32, but due to the limited NVRAM, progress inside the levels is not saved. The game makes a snapshot of the player status when you enter a level, and stores this whenever you decide to save. The preview version you've got has only 1 save slot on the CD32, but the final release will offer multiple slots with the aforementioned limitation.